Here's a new play 3D slots game by 2by2 Gaming. I think by now, everyone’s aware that Humpty Dumpty is a bit of a creep, sitting there on his wall, the human egg man, watching the pageantry go by. Nevertheless, the developers at 2 BY 2 have seemingly made the best out of a bad situation and developer a royal slot game that centres around knights and damsels. Spin and deposit today to earn some cash prizes and free spin bonuses. After taking a look through some of 2 by 2’ other games it certain that they have their own style, it’s a mixture of contemporary animation with a traditional twist. Hard to describe, but definitely looks good. Anyway, Humpty Dumpty is a 5 reel with a gameboard that’s set in front of an enchanted land. Imagine the royal palace on Shrek and this has a similar feel. The reels are filled with Toadstools, unicorns, knights and various other card symbols that make up the lower valued symbols on the game. There are lots of reasons why players prefer this game, you can also visit our guide to discover more. The Game incorporates a middle-aged theme about it and has 5 reels with 25 seductive paylines. The betting margins are quite significant and allow you to place bets for as little of 1 penny ranging up to £100. 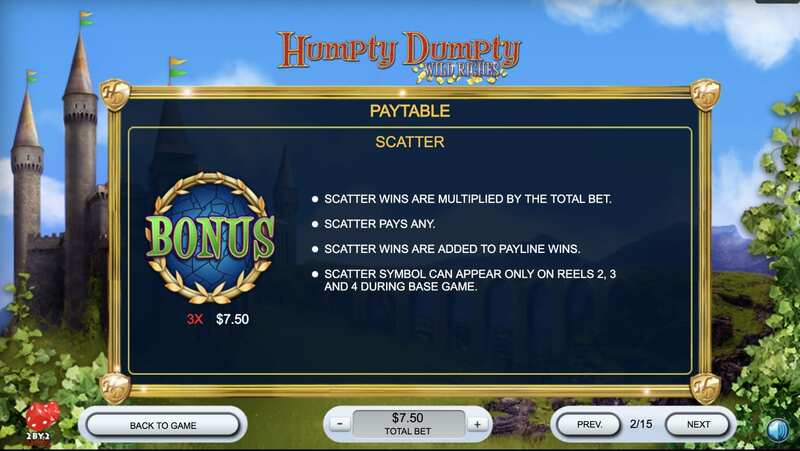 Throughout this game you’ll notice that it works in a similar fashion to other slot games that it has a couple of playing card symbols to make up the lower-value prizes on the game. The jackpot is of course won with the more prestigious of symbols. After having a spin on the free play mode, the toad stool seemed to be the character that popped up the most. The WILD, and substitutes for any standard symbol on the reels. Upon landing one of these WILDS, it will also trigger a respin, which normally means that you can generate bigger wins following other wins. The opposite of the vicious circle. 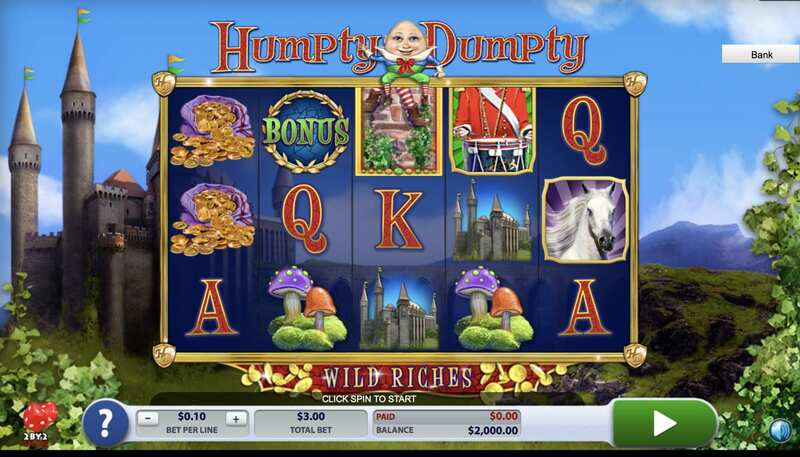 The creepster that is Humpty Dumpty will also occasionally appear on the reels and this is the guy that will award you with the free spins. The heart symbols that appear on the gameboard can help you gain extra wilds and 3 of these hearts will enable you to win a huge amount of free spins and other combinations.